Amanda Berry Smith was born into a poor slave family in Maryland, USA, in 1837. Her father and mother were Bible believing Christians and Amanda later referred to the prayers of her maternal grandmother as being instrumental in her salvation. Samuel Berry, Amanda’s father, laboured long hours as a slave by day and worked in a neighbouring field by night to earn enough to buy the family’s freedom. By 1850, having secured freedom for himself, his wife and his children, Samuel moved the family to Pennsylvania, where for many years their home was part of the famous Underground Railroad route for runaway slaves seeking liberty in Canada. Amanda had no more than a few years formal education during her childhood and was mainly home taught. 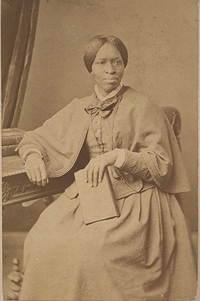 At thirteen years, she became a household servant, working for various white employers in domestic service. Though Amanda had been brought up in a home where Bible reading, prayer and church attendance were frequent, she had yet to commit her own life to Christ. At seventeen she married but was disappointed to find her new husband had a serious problem with alcohol. She soon realised her hasty marriage had been a mistake. By 1864 Amanda had moved to Philadelphia. 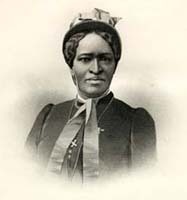 She agreed to marry James Smith, a deacon in the African Methodist Episcopal Church (A.M.E.) on the understanding that he would become ordained and together they would serve God. Smith reneged on the promise and later admitted he had deceived her and never intended to enter ministry. The marriage was a very unhappy one. Amanda worked long hours taking in laundry and undertaking other domestic chores, as well as giving birth to three children, none of whom lived to adulthood. Her prospects of following her calling seemed further away than ever, yet she hungered deeply to obey God and committed her future to Him, despite her husband’s growing opposition. When James died in 1869 Amanda decided to trust God with the future for herself and her one remaining child, a daughter named Maizie, and moved into full time ministry. Though filled with fear and trepidation about how she would be received, she began accepting invitations to preach and sing at various camp meetings and revival meetings. Amanda had always been a gifted singer and this, along with her powerful preaching, soon opened ministry doors for her. From time to time she would encounter resistance on the grounds of gender or race, but still she continued to receive invitations to address both racially mixed and all white audiences. While denied ordination or leadership opportunities within her own denomination, Amanda became the only black and the only woman member/leader of the National Camp Meeting Association. In 1882 Amanda moved to Liberia in West Africa, serving alongside Baptists, Congregationalists and Presbyterian missionaries as they worked among local tribes. While there she started a Christian school for boys. Throughout these years her own denomination, the AME, continued to withhold ordination or financial support for women, and Amanda never pressed the issue. After twelve years away, aged in her early fifties and with failing health, Amanda returned to the United States in 1890. She began making plans to open a home for black orphans which was eventually funded through her own savings and supporters’ donations. The Amanda Smith Industrial School for Girls opened in Harvey, Illinois, in 1899 and operated until it was destroyed by fire in 1918. Exhausted and in poor health, Amanda Berry Smith retired to Florida in 1912 where she lived out her final years in a home donated by a supporter. She died on February 24, 1915, aged 78. She is remembered not only for her dedication to Christ, but as a formidable evangelist, missionary and reformer who functioned successfully in Christian ministry despite the absence of male ‘covering’ during a time when women in ministry were widely treated with suspicion and contempt. May the Lord grant to His church many more women with the courage, anointing and humility of Amanda Berry Smith! Thanks for sharing, I never knew about Amanda Berry Smith. Very encouraging! So many inspiring Christian women have lived who we have been told so little about. This is the reason we include a “Her History” section on Ishshah’s Story. So glad you are encouraged by Amanda’s story, Shalle. Thankyou for your feedback.